We at DR Vitamins have been proudly selling these Vision Clarity Carnosine Eye Drops since 2002 & have thousands of satisfied customers. We invite you to try them & see for yourself. If you’re not completely satisfied within 60 days, we’ll give you your money back! Buy 3 for 5% off, 6 for 10%, 9 for 15%, or 12 for 20% off! Earn up to 29 DR Reward Points. These soothing Vision Clarity Eye Drops are certified to be free of all contaminants as shown by our Certificate of Analysis. Contains only the highest quality of lubricants which have been heavily researched for their ability to help combat dry eyes and other irritations. 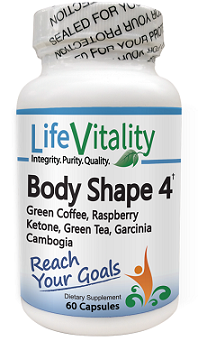 We have been proudly selling this formulation since 2002 and have many, many satisfied customers. We invite you to try them and see for yourself. If you’re not completely satisfied within 60 days of trying the product, we’ll give you your money back! As seen in Dr. Williams’ newsletter! 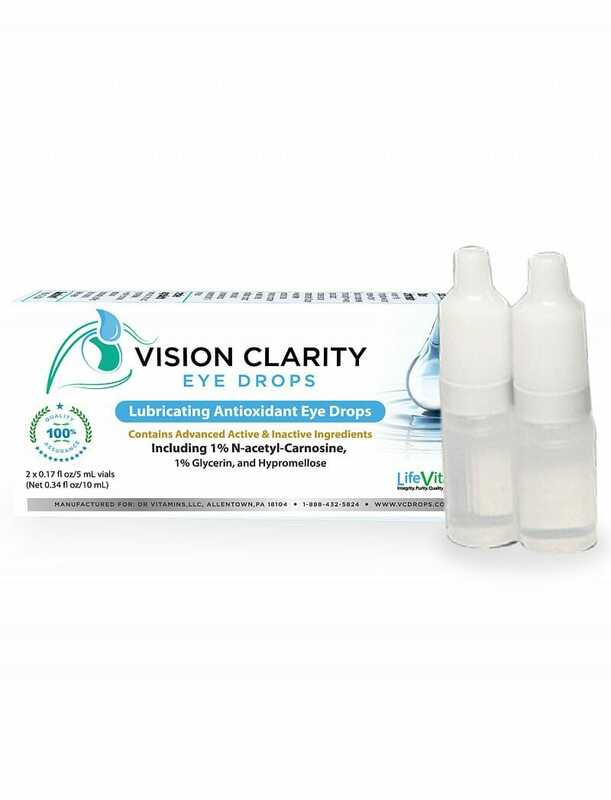 Vision Clarity Eye Drops contain heavily researched lubricants to help combat dry eye and other irritations. Vision Clarity Eye Drops are tested for sterility. Many things change in our bodies as we age. The eyes are no different. They are constantly under attack from the environment, both internally and externally. Utilizing Vision Clarity Eye Drops 4 times daily may greatly improve the eye’s condition. Our soothing eye drops are tested by a third party and we post the Certificate of Analysis publicly for each batch. You will see that there are no contaminants. These premium drops contain a number of high quality lubricants to help soothe and nourish the eyes. One in particular, N-acetyl-carnosine, has been extensively studied for its potential to provide support for healthy vision. We are confident that our carnosine eye drops are the purest and most highly certified for quality. STATEMENT: This product is manufactured in accordance with the requirements as set forth by the Food and Drug Administration monograph for ophthalmic products. The statements contain herein have not been evaluated by the Food and Drug Administration. This product is not intended to diagnose, treat, cure or prevent any disease. I used to use Bright Eyes III, but this brand seems to feel better when I put the drops in. I continue to see improvement with my cataracts! Thank you so much!!! I am writing to express my pleasure with your Vision Clarity Eye Drops. They are working beyond my wildest expectations. I made my first purchase around Thanksgiving so I have only used them on my Boston Terrier for about 1 month (1 week during that time I was on vacation and not able to administer the drops.) In a nut shell, I think she has recovered her eyesight back to where it was about one year ago in only one month’s worth of use and although she still has quite a ways to go before the cataracts go away completely, I can already see them breaking down around the perimeter of the cataract. But don’t take my word for it, take hers! We began to see behavioral changes in her after the second week of treatment. She now can see well enough to jump in and out of the car, jump off the bed at night, see treats when they are a foot away from her face, see other dogs on her walking trail when they are 30 feet away and see my husband and I coming out of the store when we are 50 feet away. Yesterday, she wanted to play with us in the house and knew where all the furniture was! So I know that both close up and distance vision has improved. (She had been completely blind for about 2 months, the cataracts had been forming for about 2 years.) 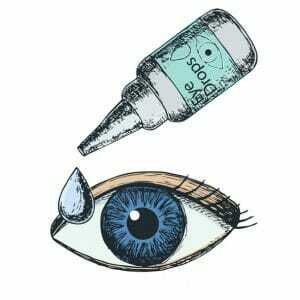 I administer one drop in each eye 4 times a day. I found that 2 drops was usually a waste of medicine as the second drop just slid out of the eye. We sit quietly and I rub her chest and belly for 30-60 seconds while the drops sink in. 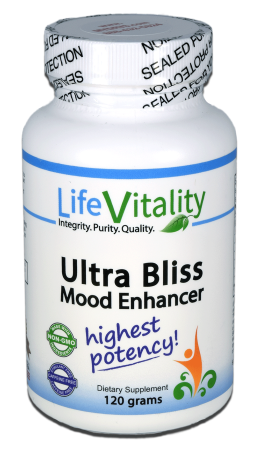 I was quite skeptical at first that this medicine would work but I am a true believer now. I also can vouch for the quality of the drops you provide even though more expensive web sites insist only theirs will work. I want to thank you for being fair to your clients and providing these drops at a much more reasonable price. My only suggestion is that you somehow upgrade your internet web access so that people see what you are offering before all the rest of those expensive sites come up and also see this medication as an alternative to surgery when people query for surgical advice for cataracts. Now that I have found your web site, you are on my “Favorites” list and I intend to be a life long customer. Keep up the good work. Great product it really works, I can tell the difference. I recommend it, Beats having an unnecessary and expensive cataract surgery. My eyes are starting to clear up, almost no fogginess. I am elated. I still need glasses but the cloudiness is subsiding. It was late August when I awoke one morning to discover that I suddenly had cataracts in both eyes, and I’m only 62 year old. I lost my health insurance as my premium reached a point of impossibility. I could not afford cataract surgery which for both eyes was ONLY $12,500. I learned of your incredible product and have been using it for several months. I am happy to report that my right eye is now almost completely cataract free and my left eye, with the greater lens clouding, is about 85-90% clear. You Vision Clarity Eye Drops are truly remarkable. Even my physicians are amazed. Thank you for your remarkable product. It’s a life changer and a eye saver literally. Just wanted you to know my fantastic results with your eye drops. I have been using them for almost a month now and the floaters in my eyes have disappeared. I feel my cataracts are much improved but I will know at my next vision appointment. The most impressive results however are with my little 15 year old Maltese, Fannie. I have been using the same drops on her 3-4 times a day just like me. Her gray spots in the middle of her eyes have been reducing steadily. Today I noticed that instead of hanging her head and looking at the floor, she had her head up and her eyes were following me all around the room and I was at least 15-20 feet away. The gray spots (cataracts) are gone!! This is overwhelming – I never expected such fast results. Your product is a miracle and a blessing. Thanks so much. My doctor said I could not have surgery and recommended Vision Clarity eye drops. 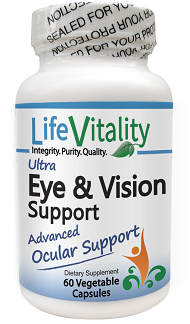 When I went back for my 6 month check-up he was amazed of the improvement in my cataracts.He said my vision improved 35 points!He now must have called you because I see that he offers Vision Clarity in his office.Thank you for a great product. Hi Guys. Need to reorder the eye drops. Having good feedback from patients that are using them. It is always good to get the positive feedback for sure. We have several that have early stage cataract formation and they have seen regression, which is a good sign. Also have many using the drops for lubricity in the eyes and they report better results than the Rx meds. I had a small cataract in each eye for years. 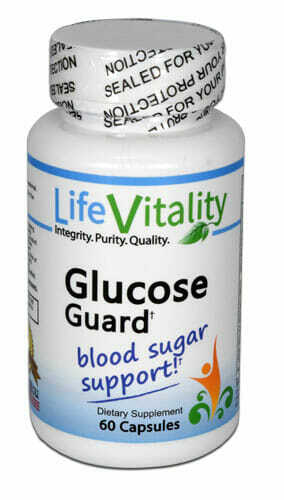 After I had used a high blood pressure med for 4 months I stopped taking it because it affected my vision. My next regular eye exam showed one eye had a cataract the dr rated 1 and the other rated 2.5. Shortly after this appt, I discovered Vision Clarity eye drops and felt in 4 or 5 months that my vision had improved. At my 6th month follow-up eye exam the dr said they (cataracts) don’t get better. He didn’t dilate my eyes so maybe that’s why he didn’t see a difference. Next follow-up, 6 months later, the cataracts are “minimal”. Thank you! My daughter has started using the Vision Clarity Drops, and I have been putting them into my dogs eyes, as a result of testimonials on your site. My daughter swears she sees more clearly, and she even thinks she will no longer have to get her prescription changed! My real success story (aside from the fact that my cataract is “resolving,” as my ophthalmologist says) is my dog’s eyes. The cataract in his “good” eye has almost disappeared, and he no longer clings to me because he can’t see. He runs and plays the way he did 5 years ago. It’s heartwarming! The cataract in the other eye has visibly shrunk, and the eye no longer looks like it’s going to explode. He’s blind in that eye, but it looks a lot better. Thank you for the magic eyedrops! It’s such a relief to be able to read again — and drive!! We purchased Vision Clarity for our 1 1/2 yr old dog who has cataracts. She was not a candidate for surgery as she doesn’t produce tears & wouldn’t heal after surgery. Your drops have greatly improved her quality of life as it has improved the cataracts. 5 months ago the cataracts were covering 100% of her eye and now its only covering 75% of her eye. We test her vision by having her follow a red laser beam at different levels, across the floor, up the wall, up the furniture and in different levels of daylight and darkness. Whereas in the beginning she had trouble finding the light (after all its just a pinprick of red on the floor), she now can follow it down the hallway and back. We are grateful for her returning sight. I have been using these for several months. I was told I have cataracts forming in my rt eye. I have had severe dry eye for some time and bigger floaters were forming. I have almost no dry eye since using these drops. My cataracts have stabilized and are not getting any worse at this time. And the floaters seem to be ligher. The best relief so far is from the dry eye. I will continue to use these drops because I only need to use them at night now, or first thing in the morning. Thanks for this formula. When my beloved AmStaf Terrier (pit bull), Kani, developed cataracts in both eyes, I was heartbroken, mainly because I couldn’t afford the high cost of surgery. Extensive research online led me to try your product over others making similar claims. It didn’t take long before I saw noticeable improvement, both in her cataracts and her demeanor. While not completely gone, yet, your eye drops are definitely working. Kani is back to her lovable and energetic self again. Thank you!!! BTW, I just reordered the three box deal and plan to continue Kani’s treatment as long as she is with me. After five months using the drops my cataract is gone and that eye is once again 20/20 – Thanks. Just placed an order for one more box of VC eyedrops. My cataract is 90% dissolved from using 6 boxes of the eyedrops. I am 90 years old and my next order will be enough to finish the job. Just thought I would pass this along to you. I would like to let you know that recently I had foot surgery and after the surgery I developed blurred vision which continued for weeks. Prior to surgery I had no vision problems. I went to my optometrist who informed me that I had developed a cataract in both eyes. This was confirmed by 2 ophthalmologists that I also saw. I was being informed that cataract surgery was my only option. Not believing what I was being told I came across your clarity eye drops and ordered them. I have been using 2 drops per eye 4 time a day for the past week and my vision has improved every day. Today is 1 week out and my vision is back to normal.This is just amazing! I plan to continue using your eye drops and look forward to scheduling an appointment with my eye doctor to discuss this development. Thanks for a great product that does what it claims. I was totally blind in my right eye. After 4 months of using the VC eye drops, my vision is much improved in that eye, and I can see light and shapes. The floaters in that eye have improved about 25%. I have also seen improvement in my left eye, with the floaters being reduced 99%. I have been using your drops for about 4 months and I am very pleased with them. I have pigmentary glaucoma, cataracts and dry eye. I’ve had cataract and glaucoma surgery on my left eye, and have been anxious to avoid surgery on my right eye, as my experience with surgery on my left eye has not been good! My glaucoma specialist had been pushing for me to have surgery again, and after 4 months of using your drops, my field test for glaucoma improved, my eyes are more comfortable and my doctor is no longer urging me to have surgery on my right eye! I plan to keep using your drops. I no longer need to use the dry eye drops Systane and Refresh Plus. Thanks for offering a great product at a reasonable cost and for your excellent service. We are so happy that you eye drops have made it as our beloved little toy poodle that was blind, can now see after using your eye drops. She can catch her toy again and the cataracts are gone in one eye and nearly gone in the other. Thank you so much for your wonderful eye drops. Thanks! These drops are working. A year and a half ago my eyes tested 30/30. I had them tested a couple of months ago and they were 30/20. I was at the point of having to have cataracts removed, but they have improved enough that they don’t have to be removed and I’m seeing good enough to get by really well. I can only give the credit to these drops. Have used this since Sept this yr. and have already seen a difference in focus, floaters and left eye is getting much better. thanks! I got my order of eye drops and am using one drop four times a day in each eye. I fully realize that any material improvement in the structure of the eye is going to take time, but in the meantime, I just wanted you to know how very grateful I am for how much more comfortable my eyes are. It is wonderful. I have been using Systane non-preservative drops and moist hot packs every day which I no longer need. Thank you for a great product. Will let you know after six months what my next scheduled exam shows. Dear Vision Clarity. It has been a real miracle for a lack of a better word. My little Maltese is only 3 years old and has genetic cataracts. Vision Clarity has help improve her eyesight already in only three months. Eye specialists at our animal hospital can’t believe it.They areat a loss for words. Thank you so much for this product. The drops are just fantastic. Thank you so much. My one eye is clearing up so I know the cataract is dissolving. The floaters are going away as well. I just came back from a checkup before my surgery was scheduled. When the doctor looked in my eye, he was astounded. No surgery is needed anymore. He could not believe it. Then I told him I have been using your drops. He got out his pad and pencil and took down all the info on the drops, your company etc. He was going to a convention and wanted to let them know what happened. I am absolutely thrilled! Thank you for very effective products and reasonable pricing! My mother no longer needs cataract surgery. We are grateful! My husband and I have been using the eye drops for six months. We both had glaucoma and went to the doctor and he said it is gone for both of us. I am so thrilled I had to let you know. My first order came in rather quickly in 3 days. The product so far seems to be effective. We notice a definite improvement so far. – thanks you very much. This product has cleared much of the nuclear stinosis in my boxer’s eyes. One eye is almost completely clear. I have been using Vision Clarity eye drops for 3 months now. I used to use can-c and found their drops oily in my eyes. Yours are very comfortable. They feel great when I put them in. The glare is used to see when driving at night went away quickly. Over the 3 months, my cataracts have improved to where I can see more clearly than I have in years! Thanks so much. Hello.I am writing to tell you that since I began using your eye drops, I have regained 40% of my vision in my right eye from Macular Degeneration. I cannot thank you enough. I really appreciate the superior product. You have made my cocker spaniel and I very happy. She is 15 years old and used to bump into walls all the time. In 2 months, she no longer bumps into walls. As I am writing this there are tears of joy. God bless you. This is a great product after two weeks I can see lights and blared objects in front of me could not see anything before. 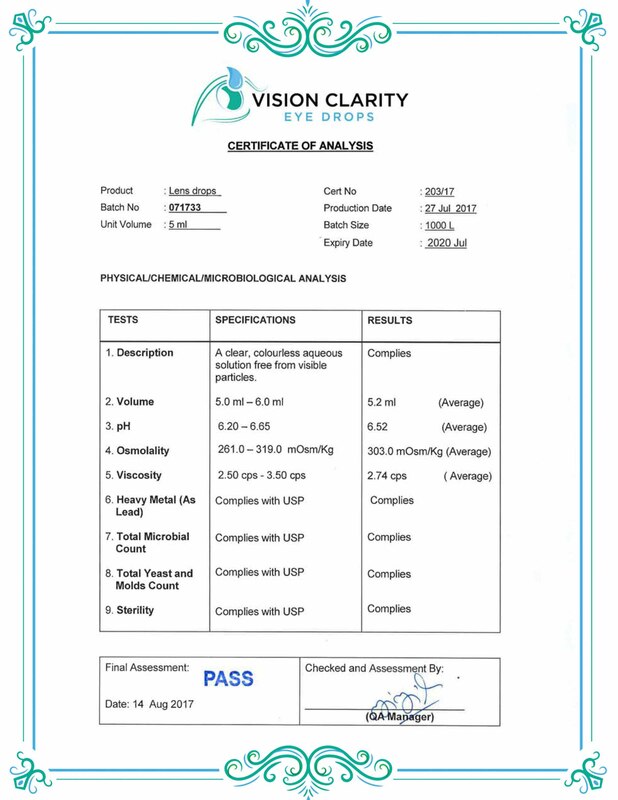 At first I was skeptical about Vision Clarity because you prices are much lower that others such as can-c. After you took the time to talk to me and pointed out the certificate of analysis and third party testing, I decided to give them a try. I am so glad I did! After 4 months my eye doctor asked me what I was doing (I did not tell him when I started, because he was really pushing surgery). He said that the cataracts looked much better, and I was able to read two smaller lines down on the chart. I told him about your drops, and he said to keep it up. When you said your company is called to serve people, not money; that really meant a lot. Thank you for offering such a good product at a low price. At first I was going to write you to tell you the only difference I saw was less glare at night. But I figured I would wait 5 months and give the drops a full try before I said anything. It took about 4 months for me to actually notice vision changes, but into the 5th month these changes keep getting better. Maybe it took longer for me, but I am happy to report a positive change in my vision. Thank you for giving me the opportunity to provide Vision Clarity to my patients. When Alfred had such good results, I felt your drops would be good for my patients that cannot have surgery. The feedback from them has been incredible. I do not understand what our medical community will not publish more studies on Vision Clarity. This could really change many lives. The halos and glare are gone! I can drive at night again. Thank you! I wanted to take a moment to thank you for Vision Clarity eye drops. My dry eye has been gone since I began using the drops 6 months ago. Since you put this spot here to write order comments, I thought you should know I am happy! I did not see any research on floaters, but I thought I would try the drops anyway. It has been 6 months now, and I still have floaters, but not as bad. My eyes certainly feel better. I will keep using Vision Clarity since it is not expensive. I have a detached retina and was hoping your drops would help. I have used three boxes and feel some improvement. I can’t find much research on carnosine drops and detached retinas, so I thought I would let you know I think they are helping. My mother wanted me to order Vision Clarity drops for her cataracts. Since I am placing my second order for an additional 6 boxes, I must tell you she is very happy. When I look at her eyes now it is amazing. She says she can see better than she has in years. My little girl can see again! She is a poodle that I love so much. Your drops are a blessing!!! Every morning I used to wake up with crud in my eyes that kept the stuck together. Now with your drops I no longer have sticky eyes. My eyes feel 20 years younger. Compared to can-c, bright eyes, and the others I tried, Vision Clarity eye drops are far better. I don’t usually email companies, but you guys have a great product. They feel great, and my vision is much better. I switched brands when I saw that can-c was shut down by the FDA in 2005 due to impurities in the equipment. Thanks for the certificates showing your drops are pure. I like your bottles better too. I just wish I could get Vision Clarity at my local store. Inactive ingredients: boric acid, citric acid, hypromellose, N-acetyl-carnosine, potassium bicarbonate, purified benzyl alcohol, and sterile water. Lean head back and look up. Instill one drop, then slowly and gently close the eye, being careful not to squeeze the drop out of the eye. Do not blink or reopen for 60 seconds. Repeat this procedure if a second drop is used. Closing the eye allows each drop to be absorbed into the eye tissue. You may also lie down or use a tilt-back chair.